We listen to your vision and make it a reality. 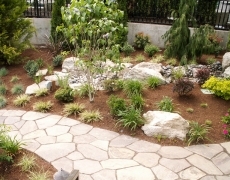 Let us take your landscaping needs from design to completion. You can be confident in our over 42 years of experience to deliver at or below budget. We employ highly trained craftsmen to ensure attention to detail. We use only the highest quality plants, stone work, water features, lighting, and beyond. From the very first meeting, Innovative Landscaping Inc. will be there to meet your wants and needs. Following our first free consultation, we draft a to-scale landscape design informed by your vision. From there we work closely with you to bring your vision to life. Our goal is to provide the best quality landscaping around. 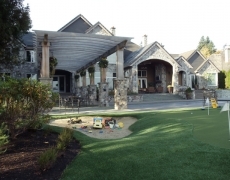 With over 33 years of experience, you can be assured that all of your landscaping needs will be taken care of in a timely and professional manner at or below budget. We can rework your existing landscape to make your landscape dreams a reality. Rework projects are one of our specialties and we pride ourselves in creating exceptional designs and executing them with precision. Our work doesn’t stop even after your new landscape has been completed. 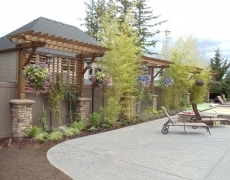 Innovative Landscaping Inc. is available for maintenance on all of our completed projects. Let us keep your yard pristine and beautiful. After years of disappointment with other companies, our experience with Innovative Landscaping was miraculous. Innovative Landscaping has integrity, is timely, efficient and reliable, does an excellent job for a reasonable price, and is an absolute pleasure to work with. 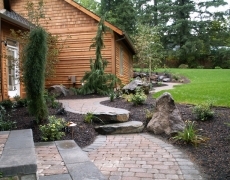 We whole-heartedly recommend Innovative Landscaping to any- and everyone. I look out my window each morning in awe of the transformation you made of our yard. No words can express adequately my gratefulness or appreciation. I wanted to thank the fine crew that worked also. They did an excellent job. They were very hard working and diligent. Even when it rained hard they continued their work so we could celebrate Christmas with a beautiful yard. When we started talking in early summer, we had no idea that we would end up with the MOST BEAUTIFUL PARK for a yard! The saying goes, "you get what you pay for". Not only did we get what we paid for, we got more than we could have hoped for in the beauty of our yard and the caliber of the work during the project.